I hear this all the time from my patients, and I can relate… because I was there once, too. In my first year of naturopathic medical school, a common breakfast for me would be a hard-boiled egg along with some nuts and fruit. I’d get to school and within the first hour of lecture, I’d be nodding off. Chalking it up to being a tired medical student, I would rush down to the street to the nearest coffee shop on our morning break to caffeinate so that I’d be able to stay awake for the rest of class. When I had the opportunity later in the year to run food sensitivity testing, I thought, “What do I have to loose?” I didn’t even think I had any sensitivities at that time! Low and behold, the most reactive food that showed up on my test was eggs…my mainstay of breakfast! Knowing that I would be asking my patients to change up their diets sometimes, I jumped into the challenge of my elimination diet, taking out eggs, dairy, almonds, corn, soy, kidney beans and a few other foods that came up as elevated on my test. While it was a struggle, after the first 5 days, I felt like my energy had increased dramatically. The biggest change? I was focused and not nodding off in classes. I no longer needed that huge coffee to get me through the day. My stomach didn’t hurt and I had more energy than I had in years! Naturopathic Doctors have several ways to conduct food sensitivity testing. Some use more of an energetic-based testing method and some use a blood test. I personally test my patients with the blood test method as I feel it gives me tangible results that I can explain to my patient from an evidence-based standpoint. 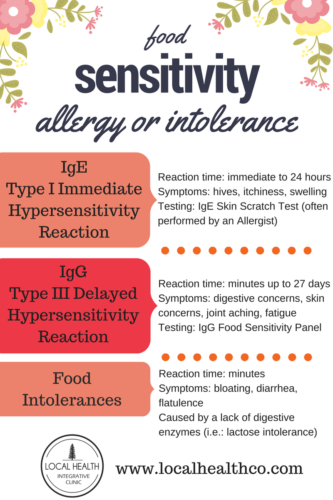 A Food Sensitivity Panel investigates at your Type III Hypersensitivity reactions, looking at an Immunglobin (Ig) called IgG. This provides information about what you might be reacting to in your diet, either within a few short minutes of eating it or up to 3 weeks later. This isn’t going to tell you what you are severely allergic to (this is an IgE reaction) but will give you some ideas for the foods that may contribute to slower reactions and symptoms such as fatigue, bloating, heartburn, brain fog, gas, and skin conditions. While IgG doesn’t give us all the information (often I will encourage a patient to seek assessment for IgE testing with an allergist as well), it can make a huge impact. I have had a patient go from taking daily, prescription strength antihistamines for her allergies to taking an over-the-counter antihistamine once a week with working with her food sensitivities. I had another patient who would have a bowel movement just once a week now having one or two daily for the past year since figuring out her food sensitivities. Another younger mother who had intense pain in her joints and ongoing digestive condition feeling pain free after just a month of keeping her food sensitivities out of her diet. To this day, finding out my food sensitivities is the best investment I have made in my health. If you’d like to find out more about your potential food sensitivities, please book in with me at Local Health Integrative Clinic to learn more.